The opening of a flower and food-inspired ‘cellar door’; sake takes flight at Lucky Dumpling Market; Moorish Moroccan street food pops up at the Central Market; and long lunches with Maggie Beer, Duncan Welgemoed and Annabel Crabb. A fresh and fruity breakfast at Flower Cellar Door. Willunga’s latest “cellar door” isn’t in the wine business. Instead, it sells fresh-cut flowers, coffee and food served in a picturesque setting with, if you’re lucky, Stormy the cellar-door dog for company. The very friendly Stormy, official greeter to those who visit Flower Cellar Door. Flower Cellar Door opened around five weeks ago and is the project of expat Californian Kyra Kahan and her partner Colin Carpenter, the owner of Willunga Plains Flowers. 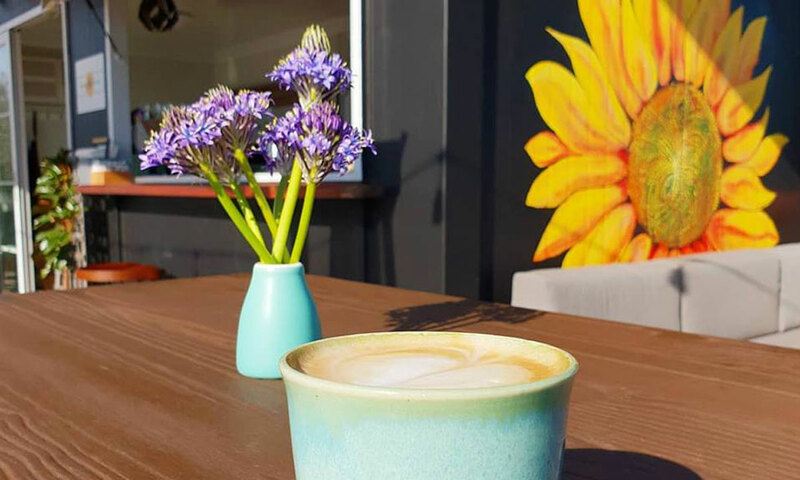 The café-flower shop is located on the flower business’s Whites Valley Road property in a purpose-built space in a recycled shipping container, complete with deck made from recycled milk bottles and sawdust. “Colin always had a dream of being able to sell flowers off the property and when we met it just came together,” says Kahan, who also works as an occupational therapist. The café serves a breakfast and lunch menu including items – many of which are decorated with flowers – such as “loaded avocado” on sourdough with marinated feta, salad and locally sourced dukkah; a continental breakfast including croissant and passionfruit yoghurt with granola and juice; gourmet toasties, and an extensive selection of tempting cakes. As well as coffee, there is a range of drinks suited to the warmer weather, such as a chai frappuccino and strawberry shake. The cakes are currently sourced from Jenny’s Gourmet Bakery in Adelaide and From the Wild in the Adelaide Hills (which specialises in raw, gluten-free and vegan options), but Kahan is also a keen baker herself. “The plan is to introduce more of my own recipes, so we can possibly bring a bit of North American flair to it, too,” she says. Willunga Plains Flowers specialises in sunflowers, lisianthus, sweetpeas and gerberas, and in addition to buying cut flowers at wholesale prices from Flower Cellar Door, visitors will soon be able to walk through the fields where they are grown. While the cellar door name is a playful nod to the fact that the café-shop is located in a winemaking region, Kahan says that down the track they hope to apply for a liquor licence and perhaps host events on the property such as movie nights and Saturday afternoon drinks. 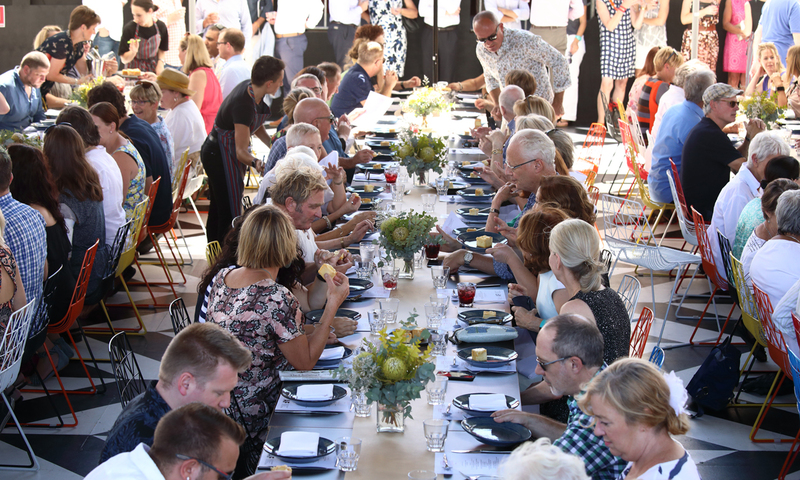 The Adelaide Festival has announced the return next year of its popular long lunch series on The Palais, with hosts including Africola chef Duncan Welgemoed, journalist and cookbook author Annabel Crabb and SA “culinary icon” Maggie Beer. The lunches will take place on March 9, 10 and 11, with tickets costing $169 (including wine). Crabb, host of the ABC pollie-meets-pots-n-pans series Kitchen Cabinet, will host the first lunch, inspired by her latest cookbook Special Guest – Recipes for the Happily Imperfect Host, co-written with Wendy Sharpe. “For food and political junkies, Annabel will be joined by a special guest to be announced, for a fascinating Long Lunch conversation,” the festival program promises. Welgemoed will draw on his roots to present a lunch celebrating “the tastes and sounds of Africa”, for which he will be joined by members of South Africa’s Isango Ensemble, who are presenting the festival show A Man of Good Hope. And for her lunch, the final one in the series, Maggie Beer will be joined by Robyn Archer, who will perform songs from her festival show Picaresque. More information about The Palais program can be found here. 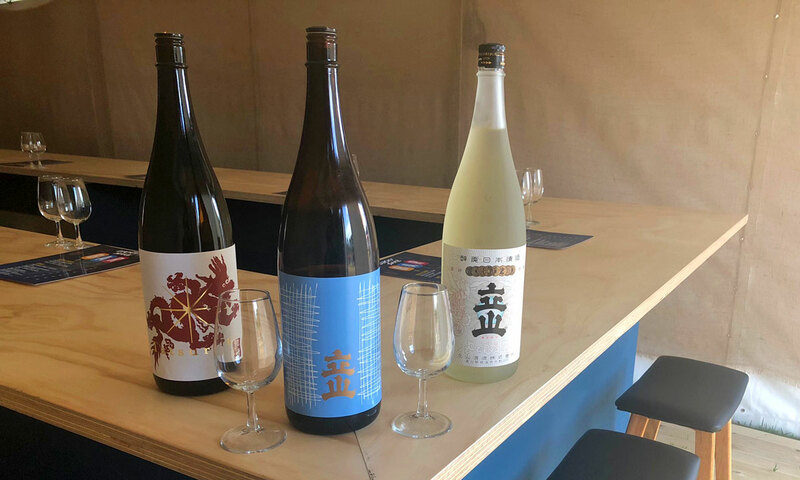 The Sake Bar at OzAsia Festival’s Lucky Dumpling Market is proving so popular that it’s likely to pop up again next year – at the Fringe Festival. The purpose-built bar was designed by Takeshi Iue and Matt Stuckey, and the market is its first outing since it made its debut early last year as a pop-up for Sake Society in Ebenezer Place in the East End. At the Lucky Dumpling Market, the bar is offering a sake list designed by Brett Goss from Shōbōsho which includes six different Japanese sakes: Tateyama Ginrei Honjozo, from the Toyama region; Saito Shuzo Kotosennen Junmai Ginjo and Mukai Shuzo Ine Mankai “Red Rice”, both from Kyoto; Toji Junmai Daiginjo, from Niigata; Mii No Kotobuki Biden Koshu, from Fukuoka; Miyoshino Jozo Hanatomoe Yon-Dan, from Nara. For $15 you can try a tasting flight of three sakes, or if you’re really keen you can buy a 600ml jug. Rowan Edwards, who runs all the bars and food vendors for Gluttony, which operates Lucky Dumpling Market, says the sake has proven very popular. “We are over the moon with the response to the Sake Bar so far, and it will definitely be popping up again. Fans of Moroccan street-food vendor Moorish Bites will have to look no further than the Adelaide Central Market for their food fix in the coming weeks. As part of the Producer in Residence series, the business has this week taken up a stall at the market selling items such as Moroccan vege tortillas, popcorn cauliflower spinach rolls, saffron and quinoa arancini served with a harissa dipping sauce, and pastila cigars (crispy pastry cigars filled with shredded chicken, spices, and ground toasted almonds). 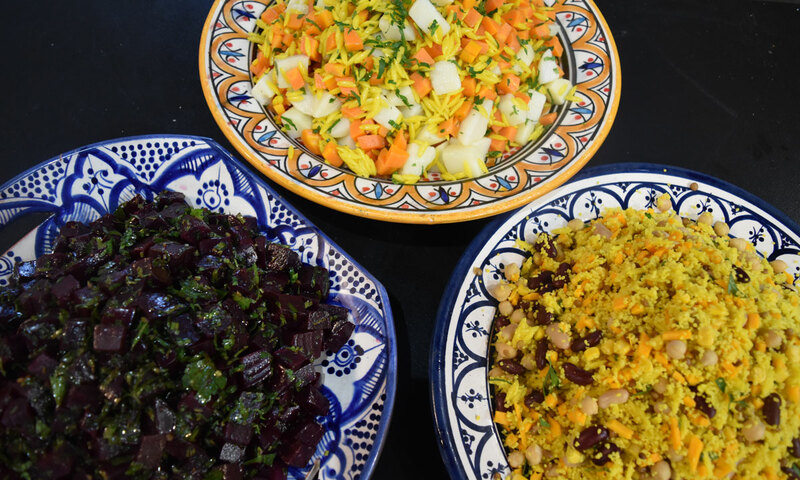 There’s also a choice of colourful salads (see above) and the always-popular meloui – pastry grilled and filled with spinach, rocket and feta. Moorish will be in residence at the market until November 17.